If you travel south from the village of Colpoy's Bay today, you make a dramatic entrance into Wiarton as Berford Street crests the limestone cliffs formed over 500 to 400 million years ago by coral reefs when the area was covered by a tropical sea. 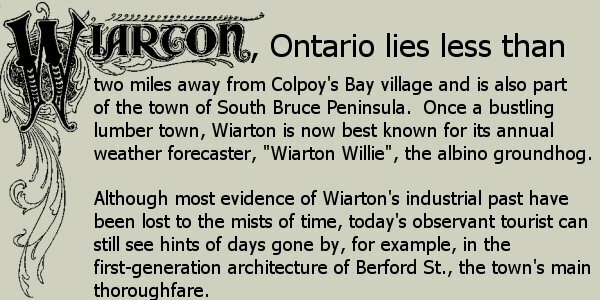 Wiarton was surveyed in 1855 and settlement began in 1866 (ten years after the settlement of Colpoy's Bay Village). At that time, Berford Street was merely a path through solid bush, stopped dead at its north end by those very limestone cliffs. 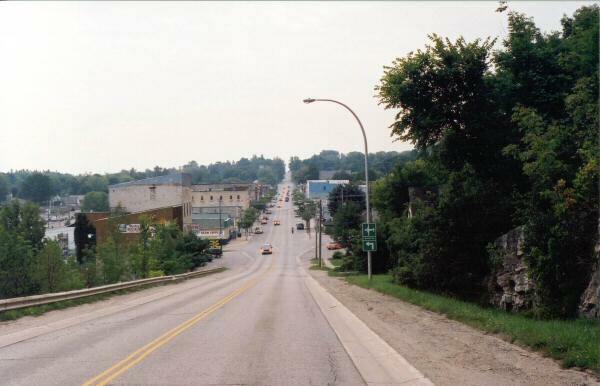 The original northern entrace to Wiarton was through Gould Street, one block west of Berford Street, thereby avoiding the cliffs. 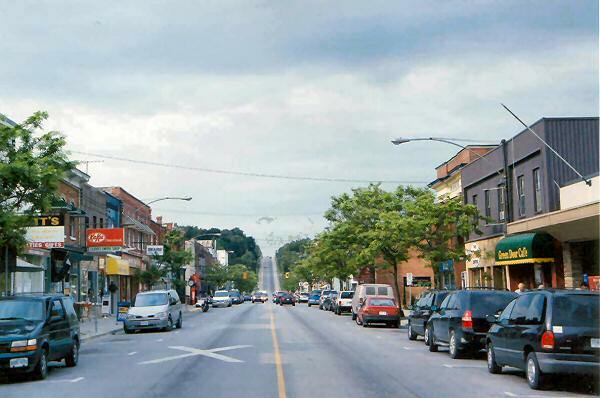 As such, Gould Street marked Wiarton's original business district. However, as the lumber industry and harbour gained in importance, one by one the major businesses relocated to Berford Street. By the arrival of the railway in 1882, Gould Street had become largely a residential district, which it remains today. Figure W1A gives three amazing early views of Berford Street looking south from the edge of the limestone cliffs (where the north hill road currently lies). Many of Wiarton's key structures are visible in these views and you can read more about them in the other pages of this website. The top image in Figure W1A, which dates from 1899, gives a great impression of the dominance of the lumber trade in the town's early days. The shoreline at left is dotted with sawmills and and the sheer volume of their output is visible at the bottom left of the image. 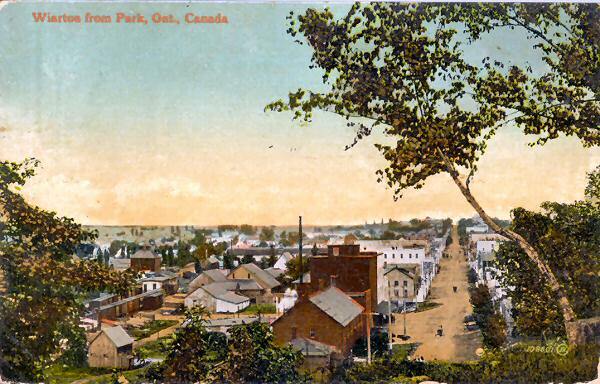 In these days, Wiarton was often referred to as "Sawdust Town". The middle image in Figure W1A is a postcard image taken about six years later. 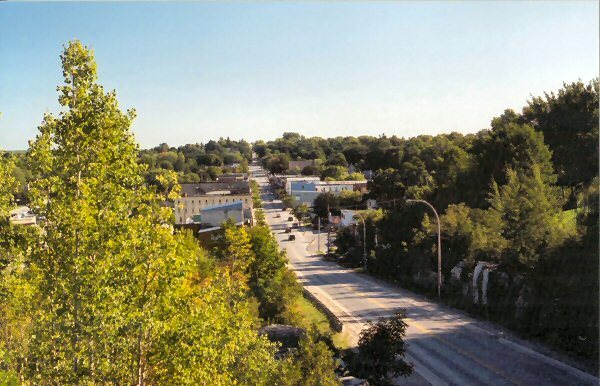 The rapid development of Wiarton is noticable between these two photos. By the early 20th century, the large brick grist mill facilities had been built on the left at the bottom of the image (today, this building serves as residential units - for more info, see the "Wiarton's Grist and Flour Mills" page on this website), behind which you can see Ely's (aka the Commercial) Hotel. The Arlington Hotel is visible as the taller white building with a visible row of windows, further down Berford Street. The original train station (c. 1882) is also within sight at the bottom left next to the tree branches. More information on most of these buildings is available elsewhere on this website. As you can see from the caption on this postcard, the top of the limestone cliffs served as a park at that time. The bottom image of Figure W1A shows a similar view likely from the late 1910s. This picture distictly shows how Berford Street once turned diagonally toward the shoreline at its north end where it met the limestone cliffs. Cutting through the area that now lies between the former grist mill and the home long-known as the "Anchor Inn", Berford St. effectively merged into what is now known as Bayview (aka Bay) Street. 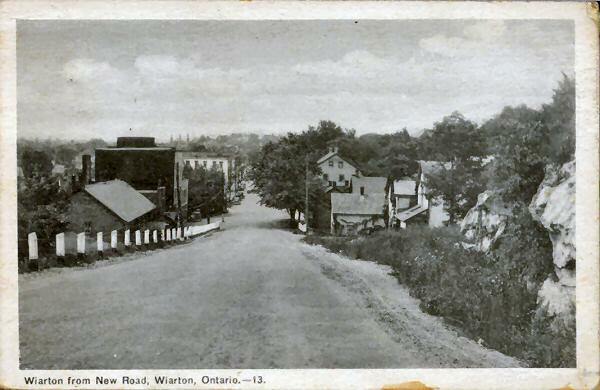 Of course, in Wiarton's early days, the streets were still the domain of the horse and carriage. However, the arrival of Wiarton's first car in 1904 marked the beginning of a growth in traffic that continues to this day. 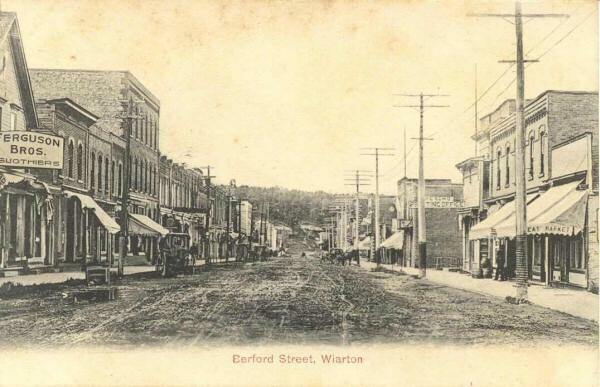 This fact, in combination with the central importance of Berford Street, led to the decision to cut through the limestone cliffs to provide a direct path north out of Wiarton. The top image of Figure W1B gives a fantastic view of the 1927/1928 Berford Street "rock cut" in progress. The finished product is shown in the bottom image. It appears the blasting, likely done with dynamite, gave a significantly less clean cut than what one sees today, however, it did the job. 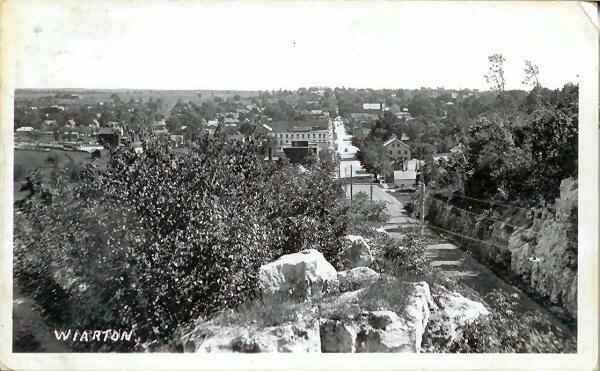 In 1928, Wiartonians had their first chance to enter town through walls of limestone, the same way one does today. Figure W1C gives four views of Berford Street from the rock cut. Note in the top image of Figure W1C, taken about 1950, how the bottom of the hill had been raised to make a more gradual slope. The buildings north of the old grist mill, at left, were no longer even with road level, thus cutting off access to the original path of Berford Street over to Bayview St.
From much the same perspective as Figure W1A, Figure W1D shows further widening and deepening of the north hill rock cut in 1968-9. 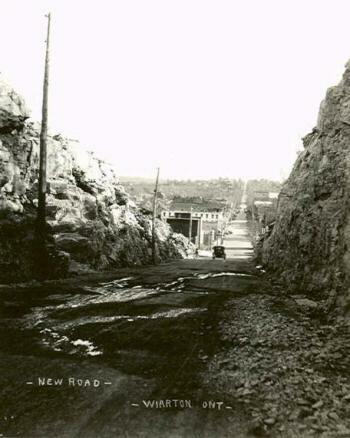 Interestingly, the old Gould Street "bypass" once used to get around the cliffs at the north end of Berford Street (in the days before the rock cut), remained accessible until the 1960s when additional blasting deepened the cut and made the road less steep. Today, one can still drive down Gould Street to get to the old bypass, but its stop sign truly marks its end...with a 10-15 foot drop! 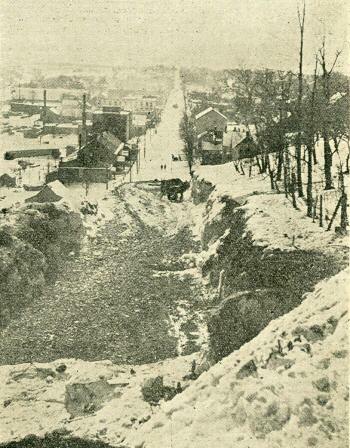 I include Figure W1E to give you a perspective of the rock cut looking north down Berford Street. In the top image, which dates from about 1905, one can clearly see how Berford Street does not continue up the limestone cliffs. Instead, the cliffs are densly forested, hiding much of the limestone from view. The 2004 photo at the bottom, however, shows northern Berford Street as it is today.